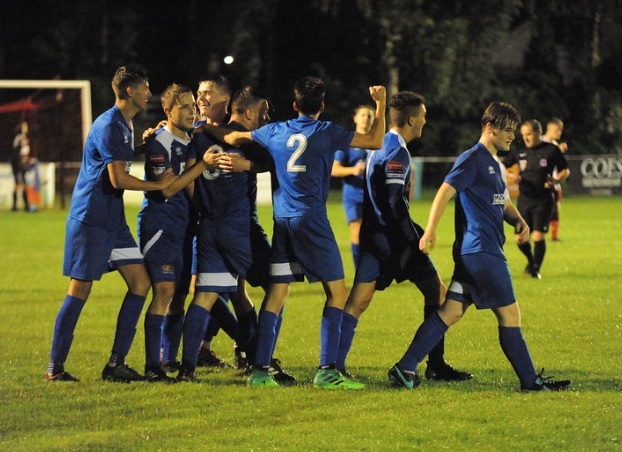 Bury Town Under-18s edged a nine goal thriller against their Brightlingsea Regent counterparts, with Charlie Cook, hitting a hat-trick for the second U18 game in a row, and Amin Mohammed (brace) scoring in a goal-frenzy first half. Regent however started on the front foot, as the visitors attacked down the left reaching the byline to whip in a low ball in across the face of goal, finding No.7 to put wide of the near post from a yard out after 3 minutes. The visitors then shot wide of Reynolds’ right post a minute later, shortly before heading freely over the bar following a corner in on the left. Regent then took the lead six minutes in, after a free-kick into the box from the left wing was headed into the near corner, 0-1 Regent. Bury though sparked quickly into life, as skipper Josh Revell shot low from 30-yards pig on the right, only to fire wide of the far post on 7 minutes. Regent then crossed a ball into the box on the right, finding an unmarked No.3 at the far post who couldn’t find the target, instead putting wide off the near post. Bury then equalised on 12 minutes and in good style, Amin Mohammed shooting low from the edge of the box and drilling past the keeper into the bottom left corner, 1-1. Two minutes later meanwhile, Charlie Cook’s free-kick in on the left wing found the head of Ethan Heap at the far post whose header went wide of the target. Down the other end, Regent’s No.11 tried his luck from the right edge of the box but shot low and straight at Connor Reynolds at his near post on 16 minutes. Two minutes later, Bury were awarded a penalty after Charlie Cook was fouled on the left hand side in the box. The Bury midfielder stepped up himself to send the keeper the wrong way, finding the bottom right corner, giving Bury a 2-1 lead from a goal down. The Young Blues then picked out Adam Newton in the box at the right post, with twenty minutes on the clock as the midfielder headed straight at the keeper. Four minutes later, great skill from Josh Revell in the buildup nutmegging a defender well saw the captain pick out goal scorer Charlie Cook on the edge of the box. The latter’s shot at goal however curled just wide of the top left corner. Bury then had two good chances to go two goals in front of the space of a minute, the first setting Amin Mohammed through down the centre, one-on-one with the keeper. The Bury striker’s touch however was too heavy as the keeper was able to gather, with 27 minutes played. The second opportunity fell a minute later, as Josh Revell’s cross in on the right was swung in directly to the far post, where Will Allison stood a yard out from goal. The header down however, was easy for the keeper. Brightlingsea though pulled level on 31 minutes, as No.9 was set through to the right edge of the box, before slotting past the advancing Connor Reynolds and into the bottom left corner to make it 2-2. Bury then had a good opportunity to retake the lead, as Josh Revell fed Amin Mohammed on the right just six yards from goal, the striker then looked for Charlie Cook in a good shooting position. The pass however was intercepted by a defender on 32 minutes. Soon after that a goalfest commenced, starting on 37 minutes as Charlie Cook was fouled on the right hand side in the box, once more the referee pointed to the spot- penalty to Bury. Cook picked up a brace, dispatching into the bottom right corner, once more giving Bury the lead. Two minutes later, it was 4-2 Bury Amin Mohammed also picking up a brace, this time drawing the keeper off his line to finish superbly into the top right corner, after being set through to the edge of the box. Three minutes before the interval however, Regent pulled another goal back making it 4-3 in Bury’s favour. A cutback across the box from the left found No.8 free at the far post to pick out the bottom left corner. Instantly meanwhile, Bury restored their two goal lead on 43 minutes, Charlie Cook picking up yet another hat-trick in superb style. Once again with a goal of the season contender, arguably even better than his goal v Holland, smashing a beauty over the keeper and into the top right corner from 35-yards out, what a screamer, a trademark Charlie Cook goal of late. With that the half drew to a close, Bury leading 5-3 after an eight goal frenzy first half. The second half began in much similar manner, with a Brightlingsea corner in on the right being cleared off the line at the far post on 47 minutes. Down the other end, Josh Revell brought the ball forward for Bury on the counter attack, where upon reaching the right edge of the box the Blues’ skipper shot low but wide of the near post on 48 minutes. A minute later, Bury had another shot at goal as Amin Mohammed, on a hat-trick, went for goal from the right hand side in the box but was denied by a block by the defender. Straight into the action, substitute John Tinde almost set up a sixth Bury goal, after quickly getting through to the left byline the Bury winger squared a dangerous ball across the face of goal. A defender however, was on hand at the near post to clear behind on 58 minutes. On 62 minutes Bury went close again to adding to their tally, as Charlie Cook again tried his luck from range. This time though, shooting just wide of the top left corner. A minute later meanwhile, Josh Revell tried his luck at goal from the left edge of the box but was denied by the head of a defender. Regent’s No.7 on the other hand did likewise on 66 minutes, only to be denied by Louis Johnson’s block. Sixty seconds later, Amin Mohammed had another attempt at picking up a hat-trick, shooting low from the right edge of the box, only to deflected to the keeper at his far post. Bury though went close again on 73 minutes, as Charlie Cook released John Tinde down the left with a great through ball. The latter’s low cross into the centre found Amin Mohammed running in a yard out from goal, who just couldn’t get a touch to direct home for his hat-trick. Four minutes later, the Young Blues went close again to increasing their advantage. The hosts’ corner in on the right found a Bury head at the near post, but was cleared off the line at the far post. John Tinde picked up the follow up though and shot towards the far corner with a deflection taking it behind the left post for a corner. At the other end, Bury substitute keeper Jordan Standring crucially maintained Bury’s two goal advantage with nine minutes to play. After palming away a Regent corner on the right off his goal line, the Bury stopper did well to tip another Regent shot onto his near right post. The loose ball fell to a Regent man, forcing Standring to be on his toes, as the visiting player went for the right corner from the edge of the box, only to be denied by a block from a Bury defender. Again, Standring was forced into action in the eighty-fourth minute, as the visitors’ shot from the left hand side in the box was palmed away well by the sub keeper at his near post, before the follow up attempt towards the far corner was blocked again by a defender. Brightlingsea kept up the late pressure though, as their No.7 headed a cross in on the left wide of the near post from 6-yards out, with 5 minutes remaining. The visitors though did make it 5-4 on 87 minutes, setting up a dramatic ending after No.7 got through on the left hand side in the box after great build-up play to pick out the bottom far corner. The last notable opportunity then fell the way of the away side three minutes into stoppage time, whose volley from the left edge of the box went just wide of the bottom near corner. With little time left for either side to grab what would’ve been the game’s tenth goal, the full time whistle blew as Bury held out for a good 5-4 win. Goals: Mohammed (12’, 39’), Cook (18’pen, 37’pen, 43’).